On Dec. 31, the Shell drill ship Kulluk broke free of the ship towing it and was stranded on the coast of Sitkalidak Island, about 60 miles southwest of the town of Kodiak. The stranding of the rig near the Alaska coast has given rise to new debates surrounding Shell's oil drilling in Arctic waters. The Kulluk grounding, which is a logistical nightmare but as of yet has had little impact on the environment, is only the last in a line of minor disasters pointing towards the inability of Shell to adequately protect the Arctic environment from ecological disasters brought about by deep sea drilling. In September, a containment dome designed to cap potential oil spills was damaged during tests, and in July, another drill ship, The Noble Discoverer, broke its moorings and drifted towards the Aleutian Islands. These mishaps have pushed Congress to reevaluate Shell's arctic drilling and the potential hazards of a major oil spill in the arctic. The disastrous Deepwater Horizon Oil Spill in the Gulf of Mexico, and the leasing of oil fields to the Royal Dutch Shell Co. to drill exploratory wells for oil between 7,000 and 10,000 feet below the sea floor, has prompted several "white papers" outlining current knowledge on clean-up and impact of arctic oil spills. This white paper, written by the US Arctic Research Commission, the US Army Corps of Engineers and the Cold Regions Research and Engineering Laboratory, highlights the research taking place at the Ohmsett Facility in Leonardo, New Jersey and the US Army Corps of Engineers Cold Region Research and Engineering Laboratory (CREEL) in Hanover, New Hampshire. It's a super interesting read and gives a great overview of the experimental work being done on oil cleanup in ice prone regions. One major concern for drilling in the Arctic waters is the impact on the wildlife in that area. When I think about oil spills in northern waters, I commonly recall the images that appeared during and after the Exxon Valdez, most especially those of birds covered in oil. 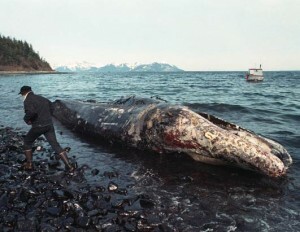 In point of fact, the oil spill killed thousands of mammals as well as fishes and birds, including whales. One risk that has received attention in the past weeks is that of excessive human-created underwater sound that might confuse underwater mammals' breeding and foraging behaviors. But with the rising fears of a large arctic oil spill that might mimic the Deepwater Horizon spill, but covered by a large amount of oil sheets, environmentalists and biologists are especially worried about the impact such a spill might have on bowhead whales. One reason for the depletion of genetic diversity in these whales is that they can break ice sheets with their huge noggins (hence the name bowhead). Apparently, they've been sneaking back and forth along ice sheets by breaking the ice with their heads and mating with seemingly separated pods. Good News: They are crafty arctic animals. Bad News: the breaks that these whales may create in the ice could potentially be flooded by an oil spill, potentially targeting these creatures for massive disaster if an underwater spill should occur. The holes that the whales make in the ice may be the very best places for the oil to pool at the surface. Check out the white papers about what we know about arctic oil spills. It's interesting stuff. If you were concerned about the Deep Water Horizon Spill, think about the logistical difficulties of cleaning up oil spills in Arctic. The animals that survive in that environment have evolved to thrive in that ice covered realm, but their evolution might threaten their very survival should a spill occur. One whale species in particular, the bowhead whale, is a heightened concern for environmentalists seeking to understand the impact of Shell's arctic oil drilling. Recent discoveries regarding this species, including the fact that they could be one of the longest lived animals on the planet (living up to 150 years or longer), make them especially interesting for scientific study. In addition to their lifespans, biologists have just released startling information about the narrowing of genetic diversity in the species. By tracing mitochondrial DNA, S. Elizabeth Alter et al found that two seemingly separate populations of bowhead whales are in fact closely genetically linked and the population has been losing genetic diversity over time- from interbreeding and population loss. While the population has rebounded dramatically from 3,400 (1978) to around 15,000 (2011), oil drilling is posing new risks to this animal. Giant Squid Footage: Why is it useful?